Scouts have explored and investigated Chimney Rock for decades. 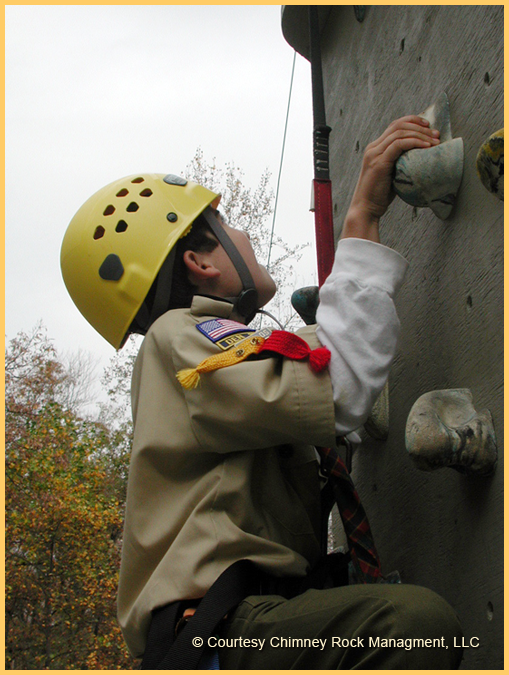 Our annual Spring Boy Scout Day is one of the best ways to see all that the Park has to offer. Enjoy morning programs, optional afternoon activities and the rare opportunity to spend the night beneath the stars with other scouts. Boy Scouts of all ages are welcome. Chimney Rock at Chimney Rock State Park welcomes Boy Scouts of all ages to a day filled with lots of natural wonder. Join our team for hands-on activities to help you meet your badge requirements in this incredible 996-acre classroom. It's not just the morning that's packed with fun. Spend the afternoon earning your Junior Ranger badge by, attempting our 32-foot climbing wall and hiking some of the most beautiful trails in Western North Carolina. Still not enough? Spend the night under the stars. Join us for the rare opportunity to pitch your tent here in the Park! Registration closes April 28 and is limited to 150 scouts.